Twitter User Says APC National Leader, Bola Tinubu And His Wife Are The Biological Parents Of Lagos State. 50 Cent has been having issues with his baby mama Shaniqua Tompkins for so long and never misses a chance to attack her verbally. But his son with Shaniqua isn't letting him get away with insulting his mother. 50 Cent, whose real name is Curtis Jackson, took to Instagram to attack his baby mama again. This time, his grouse has to do with her desire to do reality TV. According To influential chieftain of the National Union of Road Transport Workers, NURTW, popularly known as MC Oluomo Musiliu Ayinde says he has been loyal toTinubu since 1999. He was pictured at Osun elections where he dissed Saraki and Ilorin people. A Nigerian fashion designer, Isi Atagamen Sakalis, has taken to her Instagram page to testify about how she got pregnant despite having 9 fibroid tumours. The All Progressives Congress (APC) in Kaduna State has given automatic tickets to Senator Shehu Sani, Suleiman Abdul Kwari and Barnabas Yusuf Bala. The Senator, who represents Kaduna Central Senatorial District in the National Assembly, had expressed his reservations with the decision of the party in the state to adopt indirect primaries. Sani had also declined to step down for other APC aspirants scrambling for the Kaduna Central Senatorial District ticket. The aspirants are Ibrahim Usman (Sardauna Badarawa); Shamsu Shehu Giwa; Gen. Mohammed Sani Saleh; and Uba Sani, a Special Adviser to Governor Nasir el-Rufai. The families of a new couple have been thrown into mourning after the groom was crushed to death in an accident on his way to his wedding reception yesterday in Accra, Ghana. The bride who was also involved in the fatal accident is said to be battling for life in a hospital after the accident. According to reports, the Islamic wedding took place on Sunday morning, September 30, 2018. Governor Akinwunmi Ambode, on Sunday, September 30, 2018, held a world press conference at Alausa, Ikeja, where he highlighted his achievements and his desire to run for a second term, among many other issues. 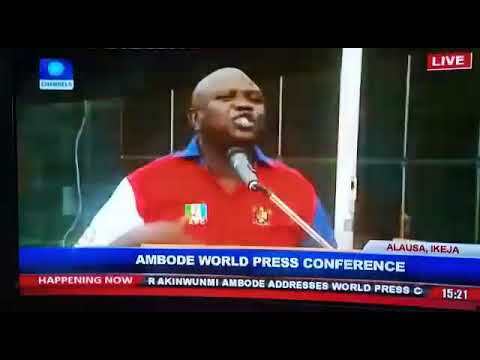 As expected, there were journalists and supporters of the Lagos state Governor present. Formula 1 athlete, Lewis Hamilton has just won his third straight race victory after clinching the Russian Grand Prix ahead of Valtteri Bottas and Sebastian Vettel this afternoon. The British racing driver, 33, who races for Mercedes AMG Petronas clinched the win after his teammate, Valtteri Bottas, pulled over to let him through as the pair approached halfway in Sunday's Russian Grand Prix. The wait is over, Nicki Minaj has drawn a river Queen from her deck of illusions. Like Drake before her, any album she drops will alienate a segment of her audience. Gone is the transitive “Pink” theme we’ve grown accustomed to. Enter Nicki, expert of the Antiquities, in the 4th term of her totalitarian regime. Manchester United staff believe Jose Mourinho could be sacked by the end of this week. United produced a woeful display as they lost 3-1 at West Ham on Saturday to record their worst start in 29 years which leaves them nine points off the top of the Premier League table. Players and staff were openly discussing the prospect of Mourinho losing his job following the game as they made the journey back to Manchester on Saturday afternoon. Speaking on BT Sport, former United defender Rio Ferdinand said: ‘I think there are some big decisions to be made at Manchester United now.